Land of Leather shares have soared after it said it was holding talks that may lead to an offer being made for it. It said that talks with a number of parties were at a very early stage. The company has issued three profit warnings since last Christmas, and has now said that orders fell 47% in the three months to 2 November as the retail sector continued to weaken. It described the retail market as "very challenging", but said significant progress has been made on cost-cutting. Land of Leather stressed that it was debt-free and did not need to pursue a sale unless it created significant shareholder value. 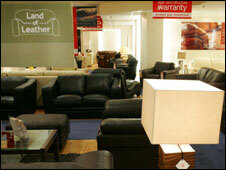 On Monday Land of Leather shares finished up 38.5% at 9p.